Our demo release came out 5 months later than hoped. So, what happened? What went wrong? Did anything go right? In a nutshell, I grossly underestimated how long it would take to move from a mostly-functional game and engine running in dev test mode, to a fully-functional demo experience with working menus, persistent game data, and all that. Furthermore, my decision to release a demo of the game before an early-access version likely contributed to that delay because, for some reason, my gut tells me that a demo -- in any form -- needs to be a complete experience. Whereas, an early-access version could maybe take more shortcuts on the menu experience and other places. I don't regret putting the demo before early access. 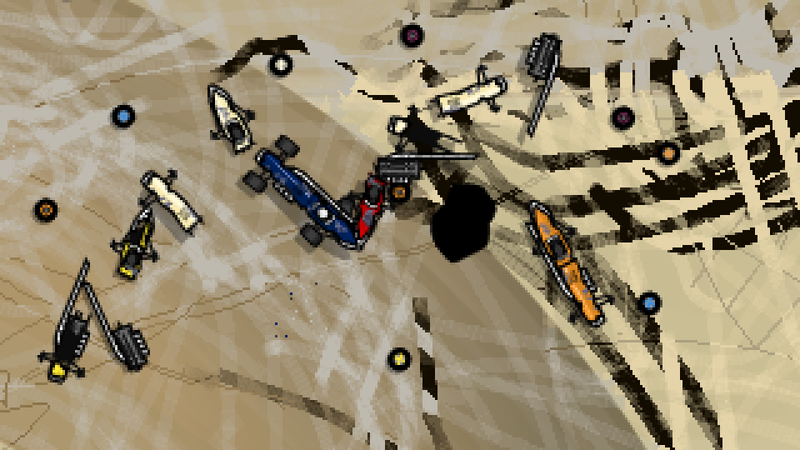 GRITS Racing looks just like many other top-down/2D racers. Thus, we really really REALLY need a way to get this game into people's hands before they buy so that they can experience just how different it is -- how different a 5-physics-objects car feels -- how different the mayhem modifiers affect game play. I could shout these things from the roof all day long but nobody's really gonna "get" it until they try it. Thus, putting a demo out before early access still feels to be our best hope to find an audience before launch. Back to that 5 months and where it went. Looking back, all I see that I added to the demo that was not in the original plan were the minigames. I added them because I felt something more was needed to help bring non-racing fans into the game. If nothing else, they are practice stages before "racing" -- if you can call any of this racing. The two minigames I added, hockey and prison dodgecar, each took only about a day to get the basic minigame up and running (due to a totally-ultimate-and-awesome game engine foundation). But, as I just mentioned above, turning such a thing into a full experience can be much more work. And, those minigames, of course, didn't really take just a day when you add in tweaking and testing. More like a week apiece. So, given that the minigames also don't share much in the way of menu and state needs with the rest of the game, I am guessing they added perhaps 2 months to the timeline. Now, back to the remaining missing 3 months. I never wrote down a schedule for how much I was guessing it might take to build up the menus etc., but I was probably guessing about a month. I don't remember my work hours very precisely but I'm guessing it took more like 4 months. Unity's UI is not as easy to build up as the tools for business apps I'm used to. Then, add in multiplayer gamepad support in the UI -- something Unity doesn't help you with at all -- and the UI just took more time than expected. Likewise, setting up and testing the game states was also more time consuming than expected. Like I said, I grossly underestimated this part and it pretty much is as simple as that (other than the little annoying time wasters that aren't worth getting into here -- even though a day here and a week there adds up too). Finally, did anything go right? Well, sure, the minigames built up fairly quickly, as did many of the mayhem modifiers (but I've only tackled the easy ones so far for this first demo release).